Spain’s conservatives pick a new leader Saturday after ex-prime minister Mariano Rajoy was ousted, with his former right-hand woman Soraya Saenz de Santamaria vying against 37-year-old Pablo Casado, who would take the Popular Party (PP) further right. In a long, emotional speech, the 63-year-old asked PP members to “be responsible in carrying out your duties”. The delegates have a choice between Saenz de Santamaria, 47, who for six-and-a-half years was deputy prime minister, and Casado, a lawmaker who has promised “hope” with a generational revamp of the party and a step further to the political right. Saturday’s victor could become Spain’s next prime minister if the PP wins general elections planned for 2020 at the latest. 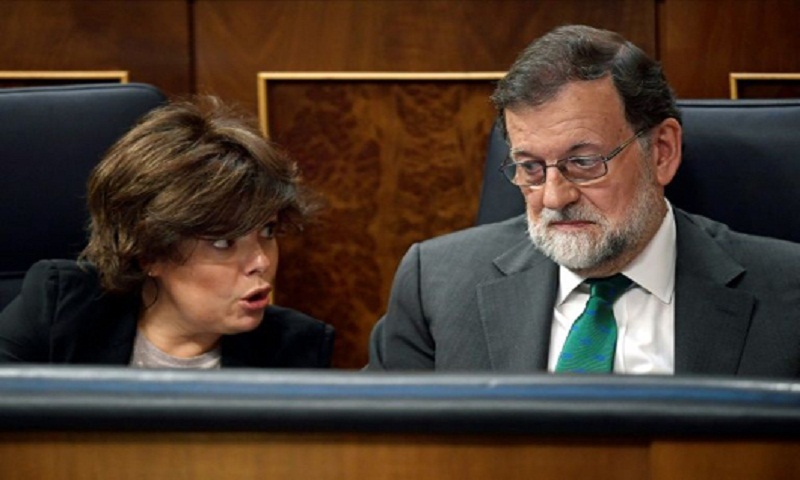 She doesn’t think the party needs to be revamped and believes she is most capable of defeating Pedro Sanchez, the current Socialist prime minister who ousted Rajoy with a parliamentary no-confidence vote. “I have energy, I want it and I have experience,” she told a campaign meeting. “Pedro Sanchez is flying a Boeing 747, and he doesn’t even have the experience to pilot a light aircraft,” she said of the centre-left opponent. On the other side is Casado, who has criticised his rival’s management of the separatist crisis in Catalonia when she was in charge of relations between Madrid and regions. He has taken a hardline stance on Catalonia, calling for the addition of offences such as illegally calling a referendum to the criminal code to boost Spain’s legal response to the secession threat. “Dialogue doesn’t work with those who want to break the law,” he said this week. Jose Pablo Ferrandiz, lead researcher at polling company Metroscopia, believes both Saenz de Santamaria and Casado will find it “very difficult to attract those who went to Ciudadanos”.